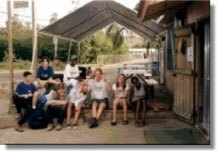 CORALations offers an annual course now open to 15 resident kids of Culebra ranging in age form 10 to 18. Conservation Youth Corps students prepare for "all nighter" sea turtle watch on Culebra, Puerto Rico. Youth Corps participants assist government agencies in monitoring the sea turtle nests. Participants solidify and share the knowledge they have gained as they prepare and present a slide presentation for their community and peers at other schools. 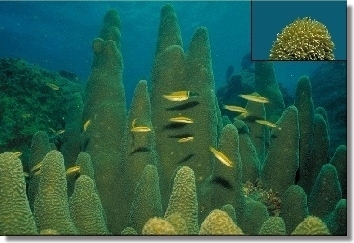 Participants observe and learn about pillar coral (Dendrogyra cylindrus). This is one of the few stony corals whose polyps (individual coral animals) can be observed extended during the day. The long-term goal of this course is to create educated and pro-active members of island and coastal communities empowered with the knowledge and commitment needed to conserve and protect valuable coastal ecosystems for their and future generations. 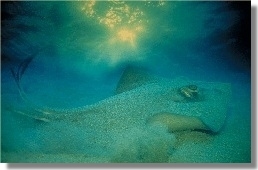 Southern stingray rises from feeding on the bottom before an underwater Caribbean sunset. 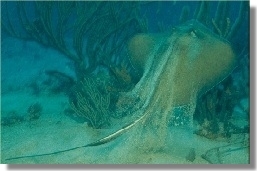 One of the many reef creatures Youth Corps participants will get to observe. The course materials and activities are designed to convey the economic importance of coral reefs, the human behaviors currently threatening this critical ecosystem, and coral reef conservation/restoration solutions that can be initiated by local island and coastal communities. 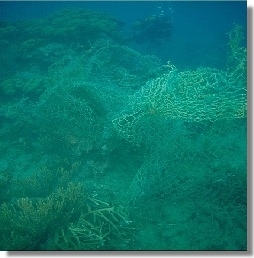 Discarded fishing net strangles coral reef. Participants will learn about and see many of the man-made threats to this ecosystem. Youth Corps member Gustavo Pabón working on a reef restoration project. Students secured and monitored small fragments of live finger corals (Porites porites) broken by a hurricane. Fragments adhered to the dead coral with special concrete survived and continue to grow. 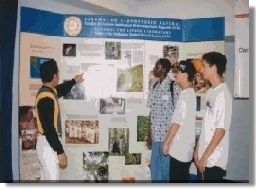 The course supplies bilingual (Spanish/English) coral reef information geared at the junior and high school level. Kids will also have fun as they participate in overnight field trips on Culebra and learn safe kayak and snorkeling skills. Youth Corps students kayak and swim to coral reef with the help of Captain Richard Barone. 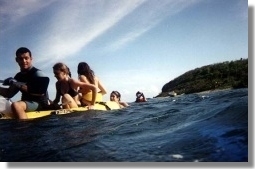 The CORALations Ocean Conservation Youth Corps fills a need for extracurricular youth activities that combine fun with exercise and education for the traditionally underserved island community of Culebra. Youth Corps students visit Smithsonian exhibit "Our Reefs: Caribbean Connections." Some Saturday classes will be shorter depending on weather or on the amount of material to cover. No activities are scheduled for the months of December or July to accommodate family vacations. Twenty-four (24) total sessions are scheduled for the year. Tired Youth Corps students nearing the end of an all night sea turtle watch - Playa Brava, Culebra, Puerto Rico. 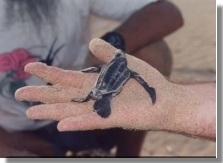 Giant Leatherback (Dermochelys coriacea) sea turtle hatchling - Playa Brava, Culebra, Puerto Rico. Awards and gift certificates will be given to those students successfully completing the course. Students cannot miss more than three sessions to successfully complete the course. There is no cost to participants, however kids are encouraged to provide their own masks, fins, and snorkels. This equipment should be purchased after the student is familiar with how to select proper fitting gear. 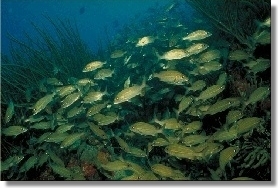 CORALations will also supply snorkel equipment, wet suits and life jackets. Participating students and parents will be required to read and sign liability release forms. If there are more than 15 applicants interested in participating, older students will be given priority, as the younger students will have the opportunity to participate the following year. All course materials and instruction will be given in Spanish with English translation provided. Local teachers are cordially invited to participate.